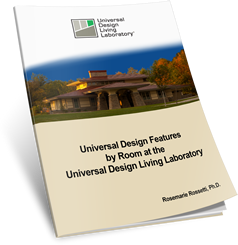 Rosemarie Rossetti, Ph.D, of the Universal Design Living Laboratory in Columbus, Ohio, is a frequent speaker at the International Builders’ Show, the 50+ Housing Symposium and other NAHB events. Paralyzed from an accident in 1998, she offers a crucial perspective on the need for universal design. Rossetti and her husband, Mark Leder, are in the process of building the national Universal Design Living Laboratory home in central Ohio. Rossetti will be at a breakout session at the upcoming Building for Boomers & Beyond: 50+ Housing Symposium 2006 in Phoenix next month. Below, she answers several questions about universal design and gives a taste of what she will discuss at the symposium. Are consumers finally becoming aware of the importance of universal design? Universal design is making its way, but it has a long way to go. Earlier this year, I spent four days on the show floor at the International Builders’ Show (IBS) talking to different people about how I’m building the national model of the universal design home. Overwhelmingly, the salespeople, PR reps and marketing people I spoke to were not familiar with universal design. However, once I explained it, they understood — and immediately connected it with the baby boomer market. 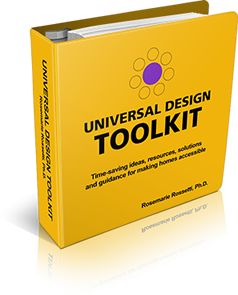 Designers may be more aware of the term and intent of universal design, but the sales teams, etc. are not. So maybe it’s just a matter of filtering the ideas to all the folks involved in home building. What I also have found is that once people are aware of the need, they respond. In January of 2005, I met with Iron-A-Way, a company that sells wall-mounted ironing systems. I asked if they had one that a seated person could use. They didn’t, but within a few months, they designed a new product and sent us a prototype. This year they had the UL-approved model in their catalog. And they had it on display at IBS, right in the front of their booth. I’m hoping I can have a similar influence on other manufacturers. For instance, there aren’t many ovens with side-hinge doors or microwaves that can be installed under the counter. Range hoods are also a problem — seated people can’t reach the controls. So there needs to be a way to operate them remotely. At the IBS, I tried to use one company’s gas grill and couldn’t even budge the steel hood, it was so heavy. I was disappointed, because I loved the look of it. But I couldn’t use it. However, I did manage to find some products that I could use and that were helpful. Kohler has done some neat things — like its pro cook sink, a little round sink that turns into a heating unit so you can cook and drain your pasta right in the sink. You never have to lift and drain. What a great safety feature. Gaggenau has an in-counter steamer that you can add to its modular cook top. It’s self-draining so you never have to worry about hot water spilling on you. I applaud companies that are doing things like that. More manufacturers seem to be putting universal design products at the forefront. They are better designed and a lot more attractive than they used to be. How much is this helping the cause? Consumers don’t want their home to look like a nursing home or like it’s a home for an “old person” because they don’t see themselves as old. So when companies like Great Grabs or Moen take the institutional design out of the equation, consumers and designers warm to these products. But many appliance manufacturers are still falling woefully short. I could only find two manufacturers that make ovens with side-hinged doors. Why do oven doors always have to open from top to bottom? What are the design standards? A door opening from the side has a distinct advantage for people. From a seated position, it’s a critical safety element. What’s wrong with the rest of those companies? I applaud companies that are putting appliances like washers and dryers on pedestals, but I need to caution them on how high the pedestals should be. For shorter or seated people, it makes a huge difference. Let’s talk about lighting. Why is lighting such a crucial part of universal design? Lighting is crucial for safety, comfort and space utilization. As we age, we lose a great deal of our sight, so we need lighting that will allow us to do things like cut our food, dial the phone or read the newspaper. And safety lighting that leads to the bathroom helps orient guests and residents alike. For my own home, our builder originally was going to give me a lighting package that would not have met my needs. So graduate students under the direction of researcher Patricia Rizzo at the Rensselaer Institute Lighting Research Center in Troy, N.Y. are redesigning my home’s lighting. They are working to blend lighting technology with what they know about aging-in-place. I met with the students to talk with them about universal design, and during our discussions they asked me to roll into their kitchen, which is part of their break room. They wanted to see how the lighting under the cabinets affected my eyes. They were worried about glare, since the lights were right at my eye level. Glare can be a factor for shorter people or people in a wheelchair. Bulb intensity and the fixture types are very important considerations. I also pointed out to them that surfaces reflect light, and that can hurt your eyes. Silestone has a matte finish countertop called “Leather.” It doesn’t create glare like high-gloss surfaces; it provides a solution. What are some small things a builder can start doing now to incorporate universal design? There are quite a few easy things that builders can do — like using lever handles instead of doorknobs, installing thermostats with larger displays and putting the thermostat lower so seated people can see it. There’s not much additional cost in those changes. Also, positioning light switches lower and plugs higher doesn’t increase costs. Adding 36-inch doors doesn’t cost much more either. Builders can look at designing kitchens with multiple countertop heights so more people can utilize the kitchen more comfortably. In the bathroom, try roll-in showers. That little lip at the entrance to a traditional shower prevents people who use wheelchairs, walkers or crutches from getting in. Builders should also be thinking about making bathrooms a little larger so that people can move around in them, and they should be locating a bathroom on the first floor. Another feature builders should consider is building one entrance to the house where there is no step and having a gradual grade on the garage floor so people can get in without a step. This way, the house is not only designed for the occupants, but it can be visited by anyone. Putting in grab bars, putting in another piece of plywood to secure them, how much more is that? If you look at some statistics, the additional cost of some universal design modifications is close to zero, and probably no more than 4% of the house cost, depending upon what has to be retrofitted. Another misconception about universal design is that these houses have to have more square footage. Effective universal design can be achieved in a 900 square-foot house. Universal design isn’t about increasing square footage, it’s about taking a different approach to the square footage. To make the kitchen and bath more functional, you can take just a little space out of the living and sleeping areas. Readjust some of the hallways and foyers to make more of an open floor plan. Under your definition of universal design, there's no need for adaptation or specialized design. This seems to be the key thing builders and designers, and even consumers, need to know — that it doesn’t take a lot of extra work to incorporate universal design. It’s all about awareness and education. What’s going to drive the building industry toward universal design is the clamor from consumers and the change in demographics. Right now, there are 56 million people with disabilities. The boomer market is in need of universal design, and they’re just starting to become aware of it and beginning to ask builders and architects to help them age in place. Another misconception about a universal design house is that is has to be ranch style, one level. That’s not true. Elevators, staircase lifts and floor lifts enable multi-level living. You can build a closet that is large enough to accommodate an elevator shaft so that it can be added later. The consumer needs to start thinking about the utility and value of universal design, as well. My current house places physical limitations upon me, and that's frustrating. My husband and I built it 10 years ago thinking that this would be the home we grew old in. After the accident, we thought about making the doors a little wider and using levers instead of doorknobs. Then reality hit. The doors weren’t wide enough. The bathroom was not big enough. Using the bath and shower was difficult, and the toilet seat was too low. We had to modify those things, and now everything looks retrofitted. It doesn’t look good. That’s my house now. We didn’t know anything about universal design 10 years ago. Now I think it’s finally coming into view in magazines and television programming. Now we have to get the builders involved. Rosemarie Rossetti of the Universal Design Living Laboratory in Columbus, Ohio, along with Patricia Rizzo and Robert Williams, will present the breakout session “A Home You Can Grow Old In” on Thursday, April 25, at the Building for Boomers & Beyond: 500+ Housing Symposium 2006 in Phoenix.